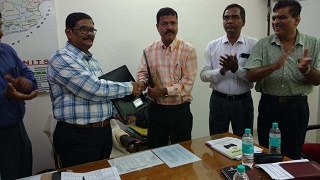 Bhubaneswar: A Memorandum of Understanding signed between ICAR- Central Inland Fisheries Research Institute, Barrackpore and Directorate of Fisheries, Govt of Odisha for installation of CIFRI Pen HDPE technology in various reservoirs of Odisha state here on Monday. Dr. B. K. Das, Director, ICAR-CIFRI, Barrackpore and Shri P. K. Senapati, IAS, Director, Directorate of Fisheries, Government of Odisha signed the MoU on behalf of respective organizations. The ICAR-CIFRI developed CIFRI PEN HDPE technology will be installed in 100 ha of reservoirs for in-situ quality fish fingerlings production and table fish production in different parts of Odisha including naxal affected districts of Navrangpur and Malkangiri. Adoption of this technology will boost quality fish fingerlings availability in these reservoirs and boosting the fish production and productivity from thesereservoirs, and in a long run improve the livelihood of the fishers of Odisha. The other reservoirs where this technology is going to be installed are in Cuttack, Mayurbhanj, Nayagarh, Gajapati, Ganjam, Kalahandi, Kandhmal, Koraput, Nuapada, Rayagada, Bargarh, Bolangir, Dhenkanal, Kendujhar, Sambalpur, Jharsuguda and Sundargarh districts. The CIFRI PEN HDPE technology was developed for in-situ quality fish fingerling (seed) and table fish production in wetlands and reservoirs. The technology was commercialized on 17 March 2018 and licensed to M/s M. R. Aquatech, Bhubaneswar, Odisha.